I've been noticing that it seems like new and unique flavor combinations are the norm now, and often times the classic flavor combinations are the new "new"! When I was planning on making Whoopie Pies for an upcoming occasion, I fell in to the new way of thinking by looking for a unique flavor combination, ignoring all of the "basic" combinations I came across. Until I realized that I wanted something classic. So, I started my search again, and fell upon the classic chocolate and marshmallow whoopie pie. When I read that it tasted reminiscent of a Swiss Cake Roll I was sold! And you know what? These did taste a little like a Swiss Cake Roll! Only I could pronounce everything in the ingredients list! Preheat oven to 350 degrees. Lightly grease (or line with parchment) two baking sheets. To make the cakes: In a large mixing bowl, beat together the butter, sugar, espresso powder, baking powder, baking soda, salt and vanilla until smooth. Add the egg, again beating until smooth. Add the cocoa stirring to combine. Add the flour to the batter alternately with the milk, beating until smooth. Scrape down the sides and bottom of the bowl, and beat again briefly to soften and combine any chunky scrapings. Drop the dough by the 1/4 cupful onto the prepared baking sheets, leaving plenty of room between the cakes; they'll spread! For smaller cakes, use a cookie scoop. Bake the cakes for 15-16 minutes (a little less for smaller cakes), till they're set and firm to the touch. Remove them from the oven, and cook on the pans. While still lukewarm, use a spatula to separate them from the pan or parchment; then allow to cool completely on a wire rack. To make the filling: Beat together the butter, shortening, sugar and marshmallow until well combined. Dissolve the salt in the water, and add to the marshmallow mixture. Add the vanilla, and beat until smooth. Spread the flat side of half the cakes with the filling. Top with the remaining cakes, flat side towards the filling. 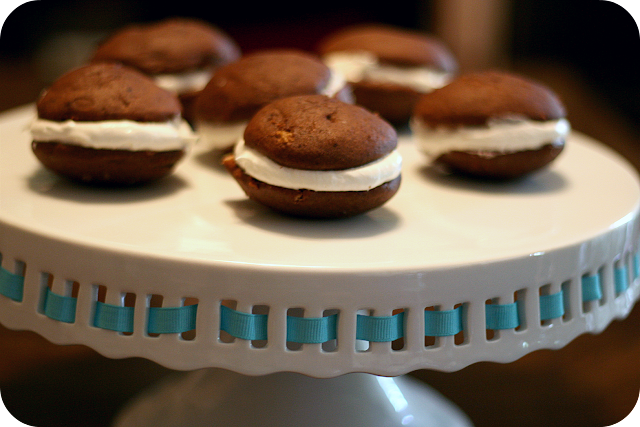 I am totally whoopie pie obsessed. These look perfect! This is definitely a recipe I think I'll be trying!